Saint Meinrad Archabbey, St. Meinrad. IN, was recognized as the Indiana Tree Farmer of the Year for 2017 at the annual meeting of the Indiana Hardwood Lumbermen’s Association on February 7 in Indianapolis. 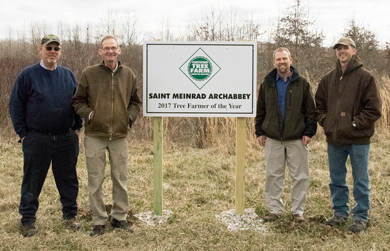 Saint Meinrad Archabbey, St. Meinrad, IN, was recognized as the Indiana Tree Farmer of the Year for 2017 at the annual meeting of the Indiana Hardwood Lumbermen’s Association on February 7 in Indianapolis. Michael Gregg, Saint Meinrad’s consulting forester, and Fr. Guy Mansini, OSB, were on hand to receive the award on behalf of the Archabbey. The American Tree Farm System, established in 1941, is the oldest and largest organization in the United States promoting stewardship of land, water and timber on family-owned land. The System provides the important service of certifying sustainably grown and harvested timber. In 2013, Saint Meinrad was recognized as the tenth 50-year-old tree farm in the state. The Archabbey’s interest in good stewardship dates back to 1923, when it enrolled in Indiana’s Classified Forest Program, established under the leadership of the distinguished conservationist, Charles Deam. Since then, the Archabbey woods have provided timber for its own building projects and, since 1965, have helped sustain the local timber and woodworking industry with over four million board feet of lumber. In 2006 and 2007, the Archabbey reforested substantial acreage of old pasture and crop land with the help of the American Electric Power Co. and the Wetlands Reserve Program of the U.S. Department of Agriculture. Many people have contributed to the Archabbey’s stewardship of its woods, including Frs. Bertrand Gilles, Joseph Mort and Kevin Ryan, monks; past managers of the property, Pat Clark and John Wilson; and currently, Andy Hagedorn and Shawn Schwindel. The help of local district foresters of the Indiana Department of Natural Resources has been indispensable – Jim Willis, Martin Grose, Joe Bruggenschmidt and Earl McCleery. Photo: From left are Shawn Schwindel, Fr. Guy Mansini, OSB, Andy Hagedorn and Mike Gregg.